Director Oliver Stone, left, historian Peter Kuznick, center, speak with Illinois State President Al Bowman, right, before their Spring Speaker Series event in 2013. Anyone looking to attend a flag-waving, balloon party for American foreign policy Thursday night at Braden Auditorium came to the wrong place. What they got instead was Academy Award-winning director Oliver Stone and historian Peter Kuznick’s admittedly left-leaning outsider take on U.S. history since the beginning of World War II. The pair drew a warm reception from the 2,500 people who attended the free event, which was the opening salvo in the University’s 2013 Spring Speaker Series and a pit stop on their own cross-country speaking tour to promote their book, The Untold History of the United States, and the eponymous 10-hour documentary series that appeared on Showtime. The main target of their work is the idea of American exceptionalism—the belief that the United States doesn’t operate like other countries, and instead of being motivated by greed or conquest, the U.S. is a force for good, an altruistic power whose main goals are to spread liberty and democracy across the world. Stone and Kuznick basically argue that the U.S. has acted no better from other countries; that the world’s superpower has been a militarizing force that has used the threat of nuclear war to dominate other nations instead of using its supremacy to push for a more peaceful world. 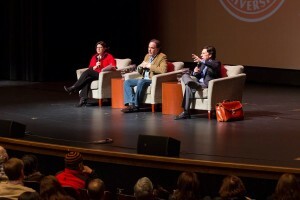 Department of History Assistant Professor Monica Cousins Noraian, left, on stage with director Oliver Stone, center, and historian Peter Kuznick. “We want Americans to be questioning more,” said Kuznick, an associate professor of history at American University. They call their works “untold,” not because the information is new or unknown, but because it has been buried and ignored, they said. The first part of the two-hour event was a screening of the documentary’s third chapter, which focuses on the context surrounding President Harry Truman’s decision to drop atomic bombs on Hiroshima and Nagasaki, Japan. The second part was a question-and-answer session featuring questions offered up by faculty and students from the Department of History. Among the arguments made in the documentary are that the bombings were militarily unnecessary and were meant to scare off the Soviet Union, and were not primarily motivated by a desire to save U.S. servicemen from a bloody ground invasion of Japan. They also argue that Japan’s surrender after the second bomb was due more to the Soviet Union’s entry into that theater of the war than the bombings. They speculate about what could have been if Henry Wallace, an anti-nuclear weapons liberal who was vice president during President Franklin D. Roosevelt’s third term, wouldn’t have been dropped prior to Roosevelt’s fourth term for Truman, who is depicted as little more than a stooge of the Democratic Party bosses and later Hawks within his own cabinet. The idea being “that history could have been different,” Kuznick said. The documentary mixes narration, music, archival footage, movie clips, and what Stone termed “selective facts” to persuade the viewer to question the conventional interpretation of history. It is a style reminiscent of the scene in Stone’s movie JFK when U.S.-orchestrated coups in the Third World are depicted. Stone alluded to critics, who have claimed the pair have cherry-picked history and have offered a false viewpoint once advocated by communists, including Kuznick’s claim that the U.S. betrayed the U.S.S.R. after the war when all that country wanted was friendly relations and a trustworthy ally. “If this series, if this book, was not criticized, we would have done something wrong,” Stone said. They see their book and documentary as attempts to rebalance views on American history that have been based on the conventional narrative that dominates the media and history books, according to Stone. “There is such an imbalance of history,” he said. The value of hosting Stone and Kuznick is in demonstrating that there really are people with a heavily distorted view of history, which contrary to Stone's assertion is the most objective of social sciences. These views need to be brought into the heat amd light of academic inquiry so they can properly wither, otherwise they fester in the same manner as conspiracy theories. I have two words that refute arguments against American exceptionalism: Marshall Plan. The Marshall plan was put in place to prop up weak post war governments that would have otherwise fallen into chaos and famine and been prey for influences that we (US) could not control. That makes us somewhat "machiavellian" and in no way "exceptional".